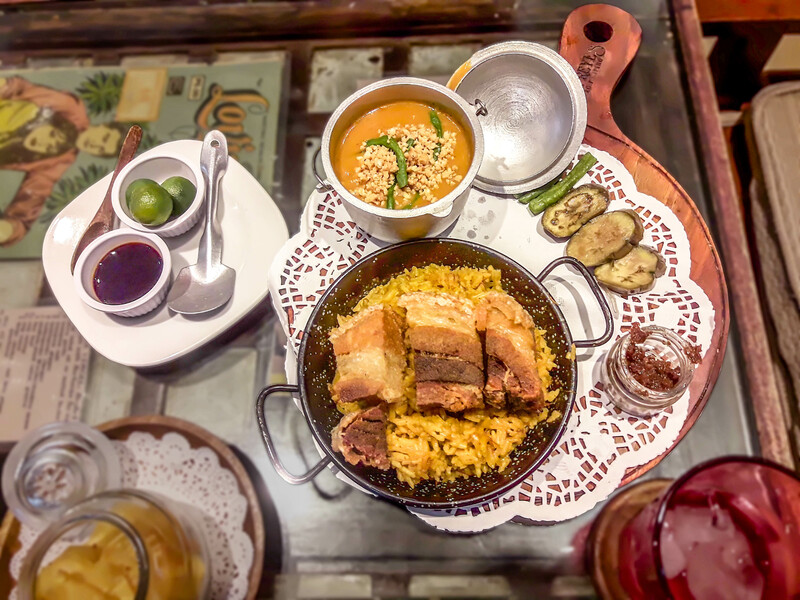 The well-loved paella gets a makeover at Casa Reyes Bistro Filipino. Imagine it embraced with the tangy flavor of sinigang or the subtle taste of bagoong. Definitely interesting! The dictionary defines paella as a Spanish dish made of rice, saffron, meat, seafood and vegetables, cooked and served in a large shallow pan. Sinigang na Paella with Bagnet Chops combines the goodness of paella and another Filipino favorite, sinigang. Sinigang is a sour and savory stew with vegetables and meat. It is usually made tangy by the use of tamarind broth. The Sinigang na Paella bursts with that tangy sinigang taste that’s just so amazing and goes perfectly well with crunchy pork bagnet chops. Another paella dish to tickle your palate is Bagoong na Paella with Kare-Kareng Bagnet. Bagoong is a condiment usually made of fermented krill (small shrimp-like crustaceans). The subtle flavor of bagoong is enjoyed in this paella. It’s served with thick savory kare-kare peanut sauce and crushed peanuts, vegetables, and crunchy pork bagnet. Kare-kare is a stew made of peanut sauce, oxtail, beef, pork hocks, calves feet and vegetables often served with bagoong on the side as condiment. For the Bagoong na Paella with Kare-Kareng Bagnet, the kare-kare is served in a small pot without the meat and vegetables. Instead, crunchy pork bagnet is served separately as the main meat for the dish. Bagoong, soy sauce and calamansi are condiments to enhance flavors for this dish, but I didn’t need those because this was already delicious and rich. Now for frozen desserts, you just have to try the new Pinoy Gelato by Casa Reyes that comes in defferent flavor based on Filipino favorites. The Keso Pastillas is gelato made with cheese and pastillas (milk-based confectionery often made with powdered milk, condensed milk or carabao milk and sugar) plus pastillas balls. Chocnut Flat Tops gelato has the rich taste of peanuts and chocolates. Chocnut is a peanut-based bite-size sweet treat Filipinos love, while Flat Tops is a brand of a local bite-size chocolate. Another dessert is the Frozen Hot Tablea which is a creamy chocolate dessert. For drinks, try the refreshing Watermelon Shake. And have coffee after that full scrumptious meal.